Simon suggested an off-beat trip to the obscure Swarthgill, lying in the hillside opposite Mossdale Scar. We reckoned it had probably seen little or no traffic for decades and fancied a look. It would be a good walk out anyway and I carried my wetsuit in my rucksack, whilst Simon sweated it out in his neoprene, which he gradually peeled off as he overheated. Walking up the dry beck, with its floor of grit cobbles, a few blocks of limestone at the side of the valley marked the sinking of the stream and the site – somewhere- of the entrance. A rusty spit in a block on the east bank showed promise and we began to clear the squeeze down to the 30-foot entrance shaft. With much heaving, trundling and whacking, a space was made and I squeezed down to shift a few jammed blocks, only to scare myself a little when I realised that the shaft flared out by my feet and I was not at all safe, ensuring a quick return to the surface to kit up and drop a ladder. 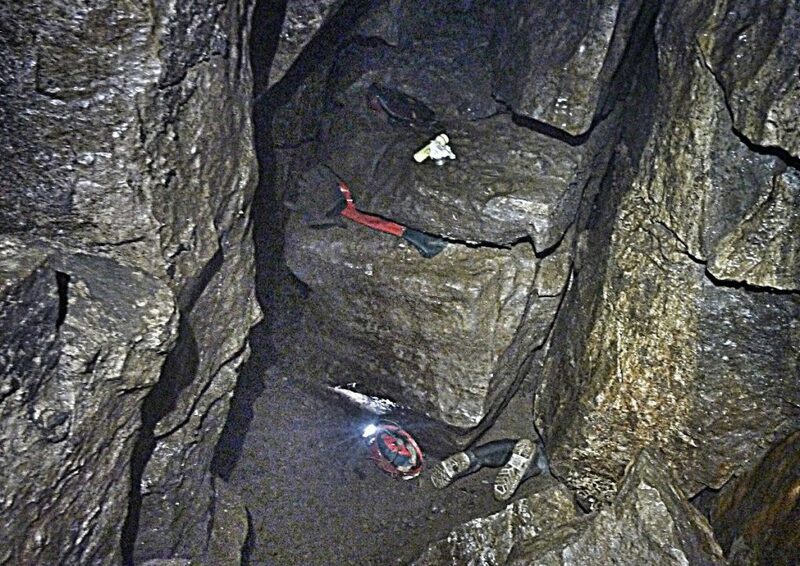 The first ten feet were tight, but the lower reaches were quite impressive and the 10m ladder proved to be just a bit short, necessitating a drop off to find terra firma above a slot in the chamber floor. From a decent rift passage, we explored several options, with a low crawl leading off to a promising passage, unfortunately proving to be choked. With the all-too-evident flood debris throughout the cave, we found every lead to be blocked and after the effort we had put in to excavating our way in, we didn’t have the energy or tools to do much more, agreeing that is one grim cave. Back on the surface we landscaped and capped the hole, doubting that we would make a rapid return and went in search of deep water to clean off. Beautiful bright sunny day, met at Kettlewell 10.30. Had breakfast then set off for Grassington the back route to avoid the (WW2) re-enactment day. All roads through village closed. Parked as for Fossil Pot. Ian, knowing it was a long walk, had brought his rucksack and would change at location. Jane and I walked up in wellies and gear which took its toll in sweat. Difficulty in locating entrance and all for giving up when Ian shouted “I have found it”. Moving boulders to look down rift shaft we dislodged a monster which jammed in the shaft. I volunteered to drop down and place slings around said problem. Ian and Jane would haul up, I would guide two metres down. Usual happened: slings slipped on extraction boulder. Decided against and went on its descent to the bottom ignoring my efforts to stop it. I picked up a damaged knee and hands feeling like a self-harmer. The only hauling of the day was Ian and Jane extracting myself from the entrance shaft due to my knee not functioning correctly. We decided to reconvene in two weeks. Covering entrance shaft we set off back down to the war torn zone of Grassington with all its Yanks. Back to 2016 and Simon and I had another look after a wet spell, finding the frequently dry streambed to be sporting a couple of nice cascades. A quick poke at the sites Denis and I had investigated proved them to be sinks, but too tight, so we went back downstream to find a spot Simon recognised. A bit of excavation revealed a cold-draughting chasm, taking a lot of water that we could not divert. Dropping a ladder down, I had a quick look in before admitting defeat to the torrent crashing onto my head. After covering the entrance with slabs and boulders, we wandered down to Mossdale to see what the upper series looked like in the wet conditions, getting into Broad Street to enjoy its fine stream passage. A week or two later we were back with survey and compass, noting that one had to trend north-east to find the cave passage, dropping onto a ledge about 5m short of the pitch base with a 10m ladder just sufficing from the extended sling on a super flake belay. From this ledge, trending upstream relative to the beck, a bit of traversing and a chimney down led into walking/stooping passage, soon lowering into a crawl and squeeze requiring the removal of some rubble and a mushy rabbit. A small chamber allowed us both to squat and survey the heavily-foamed, body-sized passage ahead, sporting not a lot of airspace. I was wearing my tatty old wetsuit, but had a good diving hood, I was soon floating along with my nose in the roof, taking a left turn at a joint to reveal more of the same, before popping out onto a low, gravelly bank. Shivering somewhat, I went back to Camp1, where Simon took some interesting pictures of my foam-covered form. Back at the ladder in a couple of minutes, we were soon out in the welcome sun, before making the long plod back to Yarnbury. Eager to get to the end, we were soon back and with my diving suit on, I was floating along the familiar route, or so I thought, to find myself stuck fast, with my nose in the tiniest of airspace, having turned along the wrong joint. Simon had gone past me without noticing and I had to ease myself back to shout for him to guide me on to the section I had previously found. A short crawl then led into the canal section mentioned in NC 1 and marked on the survey, followed by the fine, dry region of Flake Chamber. This is an impressive place after the grim passages before and we set to work to explore the terminal choke. The water soon disappears into a low, black bedding and we searched for draught amongst the dangerous complex of blocks, finding one or two leads that brought us back again a week later armed with a garden hand fork to shift some gravel. Having wormed my way under a water-worn block, I pointed my dive torch forward only for Simon to suggest that he could reach the same spot from another route in the choke…plan B required. We resolved to keep poking around in the future in here as it has such potential and offers a short, but sporty trip with the added bonus of a nice walk away from the crowds. Thanks for reading. Find out more about some of our other ongoing projects here.